Filling ships out the next weekday. Transit time is normally from 1-5 weekdays. We have owned the Ahh bean bags for at least 6 years and still love them. They need a fill up on the beads, which I am dreading due to the little beads getting into everything, but will be glad for the fluff. Just removed a cover to wash- super easy to remove and clean. This filler is so much more expensive than bean bag filler elsewhere. I don't get it. After7 years, We still love our bean bag! Wish I could buy a larger bag! I use this to fill our flagship product and it works great! My only complaint is I can't buy a bigger bag or get a multiple item discount. It's a messy process but has restored our bean bag chair to a beloved reading spot so I'd say it was worth the effort. We love the beanbag but the refill process is not smooth-at least for us! It seems to be charged w/static electricity. It clung to everything and being contained in a giant plastic bag w/a giant opening made the fill process tricky to say the least. tho we tried to keep the bag opening small the fill went everywhere and attached itself to the 2 holding the opening of the beanbag and the person filling. I am still vacuuming it up a week later-floats everywhere. Also, the zipper on the liner was embedded at the very end. It took a solid 15 min getting loosened from the fabric only to find it had no pull tab on the zipper causing me to be creative and clamp hemostats on it to pull open the zipper. A pretty frustrating process all around but the quality of the fleece and beanbag is great I am surprised however, by those who say kids jump on it all the time and it holds it shape. we only had one incident of a kid (not the owner'skid) jumping on it and lost half its size immediately requiring the expense of a refill. 4 stars if your kid is responsible and doesn't use it like a trampoline. I buy bean bags for every grandchild that turns 2 year old! This is my third one and I will have one more to buy!!! :) These are the best bean bags. These kids have put them through the run and jump wringer and they look like new. One grandchild has had his for 7 years! Love these bean bags! The bean bags are durable and well suited for the kids, but the filling deflated fairly quickly. *Ahh! Products: Commercial use will tend to compress the filling quicker than residential use. Kids (And Dog) LOVE It! I bought this for my son's room three years ago and am just coming back for a quick refill after all this time. The kids jump in it, the dog has chewed it, it has been washed several times and holds its color and never shrinks! My husband and son sit it in every night for stories and it hasn't shown any wear. I even have to drag our puppy out of it because she just adores it! After three years I am just now coming back for refill - my 200+ pound husband and five year old son sit in it every night and the thing has held up really well. The only problem I have is that the dog loves it too much and chewed a little hole in the outer layer, but she left the inner layer alone, so I just flip it over without any leaks! sent the giant bag to grandchildren who live in a different state. they enjoy it very much, and the parents like it too. will surprise them with the refill bag, and wait to hear how they like it fluffed up again. best for interactive play ! 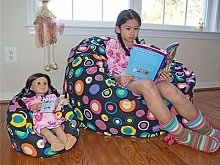 bought the biggest bean bag for Grandchildren, and have really liked how ACTIVELY they enjoy the beanbag. They leap, jump, climb under and over, and once in a while sit still it this giant fun bag! after a couple of years, getting the refill , anticipating their continued enjoyment. one giant bag/ 3 grandsons leaping loonies! getting the refill for the giant bag. got this at my daughter's request for the grandsons and it has been a wonderful investment in fun, comfort, creative play, and energetic play! they love to leap off the couch and into the bag. over and over and over again! Love our beanbags, going to order a refill. Quality is there so do not want to toss the bags! Filled up and good to go! Bought an Ahhh bean bag for my grandson several years ago and it was getting a bit flat...Replaced filling with the virgin beads and we should be good for another 6-7 years..Love, LOVE, these bean bags and the excellent quality and service provided! Have ordered more bags for other grandkids over the years as they will outlast anything else on the market. You definitely get what you pay for with Ahhh bags!!! There is a very happy 7 year old thanks to your beanbag "beans"! Thanks for everything. My Bean Bags Are Full! After having our Ahh! bean bags for two years, they were getting pretty flat. The recommended filler was the perfect amount to get our two bags big and fluffy again. And the Loyalty Coupon was very much appreciated! Thank you! You are the only company that I found that has bean bag filling that is small enough. I have bean bags from Italy and your filling works perfectly. Everyone else has chunky or pieces that are too big. Filled my bean bag chair right up, now it's not a flat pancake anymore and my kids can use it again. Great product. It was a little messy because we accidentally spilled some, but we managed! Just wanted to let you know that the styrofoam beads you sent worked perfectly. I changed out the shredded foam and replaced it with your filling and my bean bag sits so much better now. I don't fall off the side anymore LOL! Thanks a lot.